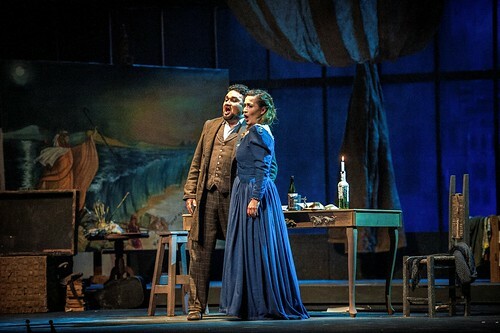 Fair warning before you purchase tickets to the Mexican production of Giacomo Puccini’s La Bohème, presented by Forum Cultural Guanajuato at the Teatro del Bicentenario (Forum Cultural Guanajuato): you will need LOTS of tissue. An amazing opera in four acts that reminds me of my childhood (my Mom, who was a soprano in her youth, sang the Musetta character with her own troupe), this version of La Bohème (starring Ramon Vargas, one of Mexico’s great voices, as Rodolfo, the gorgeous Barbara Haveman as the ill-fated Mimi, George Petean in a spectacular turn as Marcello, and the Mexican soprano Maria Alejandres, one of Mexico’s young promises) is an amazing show that (no surprise) has already sold out its two other dates. I attended opening night of La Bohème with my Mom, my brother and my sister-in-law. My brother loves opera, and our mother used to be an opera singer and she sang La Bohème so we all had personal connections with the show. 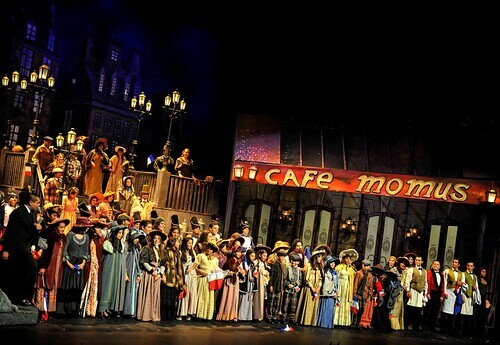 But beyond these, I think the best way to summarize this portrayal of La Bohème is to define it as exquisite. With Haveman and Vargas as the cornerstones, this version of La Bohème showcases, I think, what Puccini’s La Bohème was supposed to demonstrate: that much as Paris is synonym with opulence and beauty, artists’ life was nothing but. 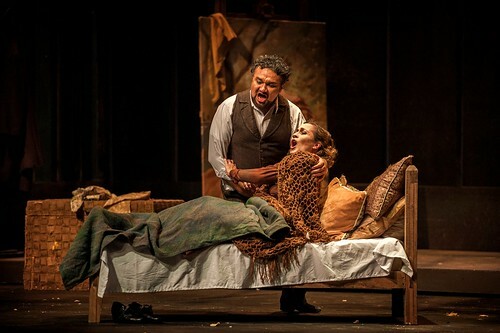 La Bohème is a portrayal of life as an artist (Rodolfo is a poet and a writer, Marcello is a painter). They live “the bohemian life” (la bohème), but in doing so, their life is always at risk because of their extreme poverty. Mimi (a seamstress) and Rodolfo fall in love during a short (and fortuitous) visit and enjoy a couple of scenes of extreme joy and happiness. However, as anybody who has read the 4 act libretto will tell you, Mimi’s health takes a turn for the worse because of tuberculosis, the illness that took Europe by storm in the nineteenth century). I shed tears throughout the entire show. While every single aria of the opera was amazing, the participation of the el Coro de Valle de Señora was absolutely stunning and heartwarming. This chorus started with children of shoe factories’ workers, and has grown through the years. I am a big fan of introducing children to the fine and performing arts from childhood. While you won’t be able to buy tickets for La Bohème (this time) you should totally check what the Forum Cultural Guanajuato has in store for the fall. I will be attending and reviewing several of their shows. And I’m thrilled to see that just as Vancouver has a thriving arts community, so does Leon. I will be also checking out what is in store for Aguascalientes! Disclosure: My Mom paid for her, my tickets and those of my brother, sister-in-law, on her own dime. As always I retain full editorial control of what is published on my site. It sounds beautiful! I have always wanted to see La Bohème live.